Cole and Carter receive B’nai B’rith’s Southeastern U.S. Plaque for Public Service. After witnessing a Ku Klux Klan motorcade drive through Tabor City, North Carolina in July 1950, journalist Horace Carter began writing Klan-related editorials and reports for the Tabor City Tribune. His work on the subject spanned more than three years and totaled nearly 130 items. In May 1953, his efforts were recognized when he received the Pulitzer Prize for Meritorious Public Service. 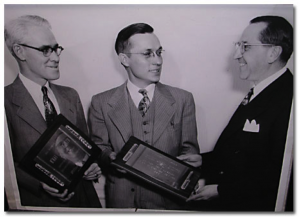 Sharing the award with Carter was a neighboring publication, the News Reporter of Whiteville, NC, and its editor Willard Cole. Like Carter, Cole wrote editorials against the Klan, risking his safety and the newspaper’s welfare. Working together and alone, both men received numerous threats but persisted in their protest of the Klan’s racist rhetoric and vigilantism. 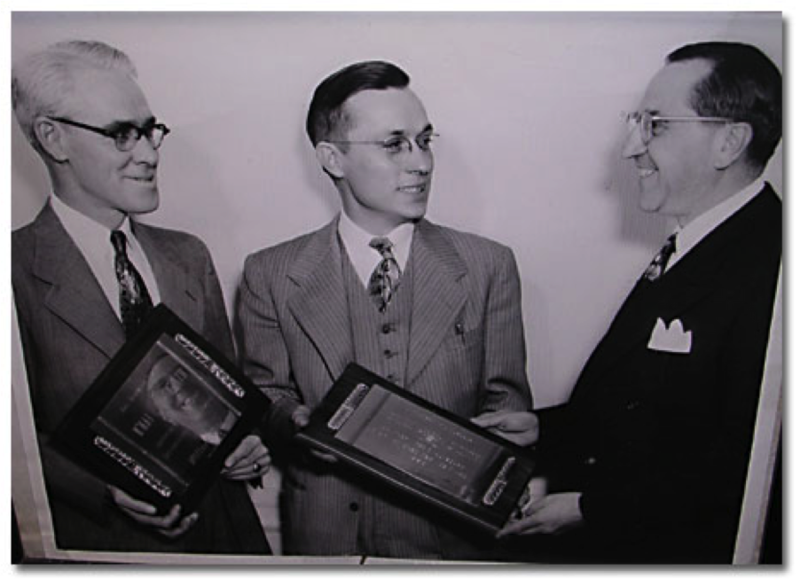 In addition to the Pulitzer, Carter and Cole received numerous other awards and recognitions. Below, find several selections from Carter’s work for the Tabor City Tribune, including a front page exchange between Carter and Klan Grand Dragon Thomas Hamilton. Additional sources are housed in the Southern Historical Collection at UNC-CH. The following two items appeared in the July 26, 1950 issue of the Tabor City Tribune, published after Carter witnessed the Klan motorcade. After publishing his first editorial against the Klan, Carter received anonymous threats by phone and mail, in addition to notes posted on his office door and car windshield. Carter also received letters in support of the Klan, though few were signed. Carter made it clear that he would print any that were signed, and two weeks after his first editorial appeared, he published a letter from John Hardee. Carter reprinted Hardee’s letter as it was received, keeping spelling and grammar intact. During the summer of 1950, numerous Klan motorcades paraded through small towns in eastern North and South Carolina. Five weeks after a Klan motorcade appeared in Tabor City, the Klan visited Myrtle Beach, SC with disastrous results: shootings took place at a black-owned nightclub and a police officer—wearing a Klan robe—was killed. Here is Carter’s initial coverage of the event. In the weeks following the Myrtle Beach shootout, a public feud grew between Klan leader Thomas Hamilton and Horry (pronounced OH-ree) County Sheriff Ernest Sasser. The sheriff arrested Hamilton and several others for the Myrtle Beach shooting. Hamilton responded by intensifying his prior claims that the sheriff was corrupt. A grand jury failed to indict Hamilton and his cohorts for the violence. At an ensuing public Klan rally, attended by nearly 8,000 people, Hamilton bashed the sheriff and many other public figures, including President Truman. Carter attended the rally and logged the following report and editorial. In response to the Klan attacks of early 1951, Sheriff Sasser of Horry County arrested seven men, and claimed that he was adding special deputies to combat Klan violence. Soon thereafter, flyers were distributed in Tabor City and surrounding communities titled “KKK NEWS,” which included the Klan’s charge against Sasser’s corruption. Carter, who was investigating both the Klan and Sasser, made the following editorial plea. While Klan Grand Dragon Thomas Hamilton made allegations that members of the local law enforcement were corrupt, other scandals unfolded at the national level. Many members of Truman’s administration resigned or were fired over financial misdealings. Under the direction of Senator Estes Kefauver from Tennessee, an investigative committee uncovered links between organized crime and elected officials in several cities and states. At the same time, there was persistent concern that Communists had infiltrated the American government. In the editorial that follows, Carter voices concern that those events empowered the Klan. He also criticizes the group’s secretive nature. Carter’s “Breakdown in Government” editorial raised the ire of Grand Dragon Hamilton, who was particularly unhappy with the editor’s observation that the only other group in America with secret membership were Communists. Hamilton fired back a letter to the editor defending his members and strongly suggesting that Carter was a Communist.